After hearing people go on and on about its awesomeness I finally gave award-winning comic series Fables a shot. I got my comic-lovin’ hands on the first volume, Fables: Legends in Exile, and instantly got to reading. Check out my thoughts on the hit series below! The artwork in this volume wasn’t impressive in the least. It was pretty much classic comic book artwork. It wasn’t bad, but it wasn’t fantastic either. Just blah. The artwork in future Fables comics is amazing, but these first 5 issues aren’t memorable. I love the idea of all fairy tale people living in the modern world, it’s a fun idea. But the actual story in this volume was about the disappearance of Rose Red, and well, like the artwork, it wasn’t all that memorable. It was just an overdone story of who-done-it. We got to meet Bigby Wolf, the shapeshifting Big Bad Wolf, but that was the only awesome thing in the story. His transformation in the comic was badass, but following him and Snow White as they try to solve the mystery of Rose Red wasn’t all that great. Overall, I was a bit disappointed by Legends in Exile. Will it stop me from reading more Fables? Probably not. But this first volume was a downer. 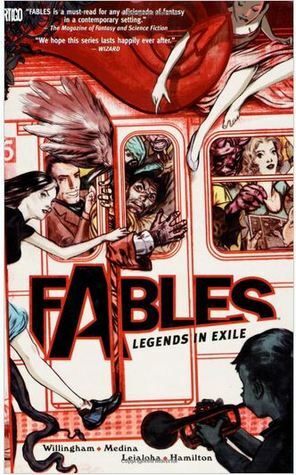 Have you read Fables: Legends in Exile? What did you think?